GAZA: Three Palestinian boys were killed in an Israeli air strike on the Gaza Strip frontier on Sunday, medical officials in the Hamas-run enclave said, while Israel said it had hit suspected militants trying to blow up part of a border fence. The Gaza Health Ministry said two of the dead were aged 13 and one aged 14. 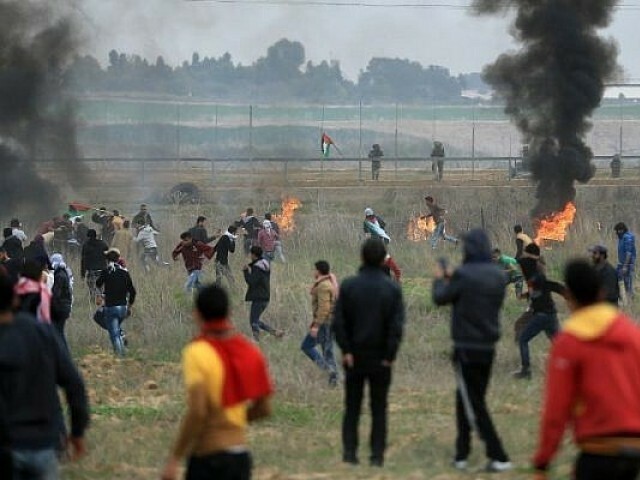 Gaza medics have tallied more than 216 Palestinians killed by Israeli forces at the frontier during almost seven months of Palestinian protests against Israel’s blockade of the territory and in support of a right for Palestinian refugees to return to lands in Israel. One Israeli soldier has been killed by a sniper. Israel says its lethal response is necessary to prevent armed infiltrations from Gaza. The violence has occasionally escalated into shelling exchanges that Israel has warned could trigger war, while Egypt and the United Nations have repeatedly mediated truces. In Sunday’s incident, an Israeli aircraft struck “three terrorists adjacent to the fence who were trying to sabotage it and were apparently planting a bomb,” the Israeli military said in a statement. Four Palestinians were killed at the border on Friday, and a Gaza militant group responded by firing a volley of missiles into Israel, prompting scores of Israeli retaliatory air strikes on Saturday, although nobody was killed. Two million Palestinians live in Gaza, most of them stateless descendants of people who fled or were driven from homes in Israel at its founding in 1948. The narrow seaside territory has been ruled by Hamas, since 2007, during which time it has fought three wars against Israel. Israel and Egypt have maintained a blockade for security reasons, which the World Bank says has brought the territory to a state of economic collapse, nearly entirely dependent on international aid and without adequate electricity, health care or clean water.